Thomas Andrew Bailey was born September 3, 1827. He was married to Margaret Jane Carson on November 27, 1849. Margaret Jane was born June 1, 1832. In the 1860's Thomas A. Bailey and family left Mississippi in a covered wagon on their way to Texas. There were three families, thirteen people in all, with their household goods crowded into the "two wagon caravan". They traveled the rugged and sometimes dangerous roads for six weeks before reaching Collin County, Texas. They settled in Verona, where the men cut down trees to build log houses. The women cooked on open fireplaces. Mrs. Sallie Jeffcoat, daughter of T. A. and Margaret Jane Bailey, was asked to relate her memories of the journey to Texas. She laughed and said she and her brother Bob Bailey probably walked and/or ran half the distance from Mississippi to Texas because it was easier to walk than ride in the crowded wagons. Her oldest brother, Wylie Bailey, was the life of the covered wagon group. He had a sense of humor, and he kept the group looking forward to Texas rather than backward to Mississippi, by the many witty things he said and did. At the end of each day, when camp was made for the night, everything that was killed that day (rabbits, squirrels, ducks, etc.) was put in one big kettle to cook for the following day’s meal. Thomas A. Bailey and his son-in-law, M. N. Stroup, erected the first cotton gin in the Verona community. 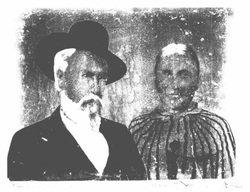 M. N. Stroup was the father of Miss Hettie Stroup, long time Methodist missionary. T. A. Bailey was her grandfather. The Bailey’s were faithful members of the methodist church and active in the affairs of the community. Their christian influence was of utmost importance to them. T. A. Bailey was also a Mason. Margaret Jane Bailey died February 16, 1897. Thomas Andrew Bailey died October 17, 1919. They are buried in Verona cemetery, Collin County, Texas. Mrs. Bailey’s grave is marked with a tombstone; Mr. Bailey’s is not.